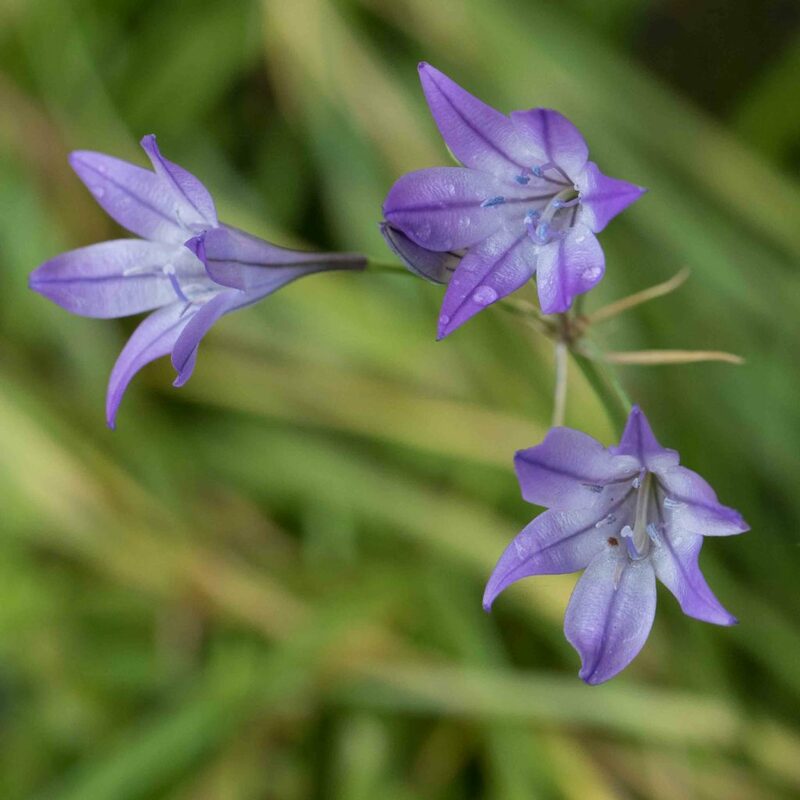 At first glance this might be mistaken for Golden Brodiaea (Triteleia ixioides) but the narrow, strap-like perianth lobes are distinctly different. 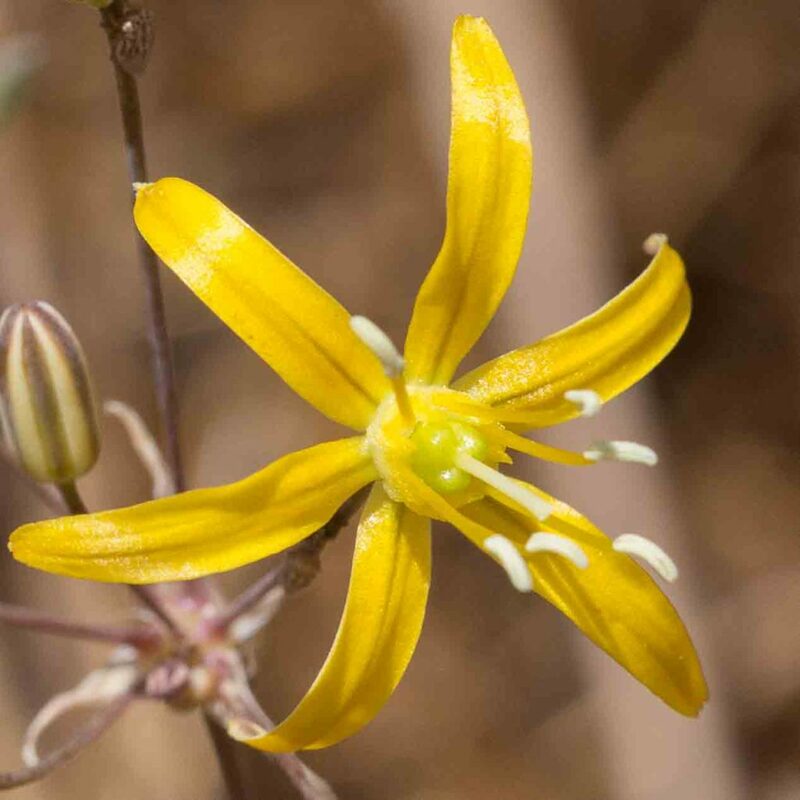 More important, the filament bases are expanded to form a nectar cup with shallow to awned cusps between the upper, thread-like parts of the filaments. 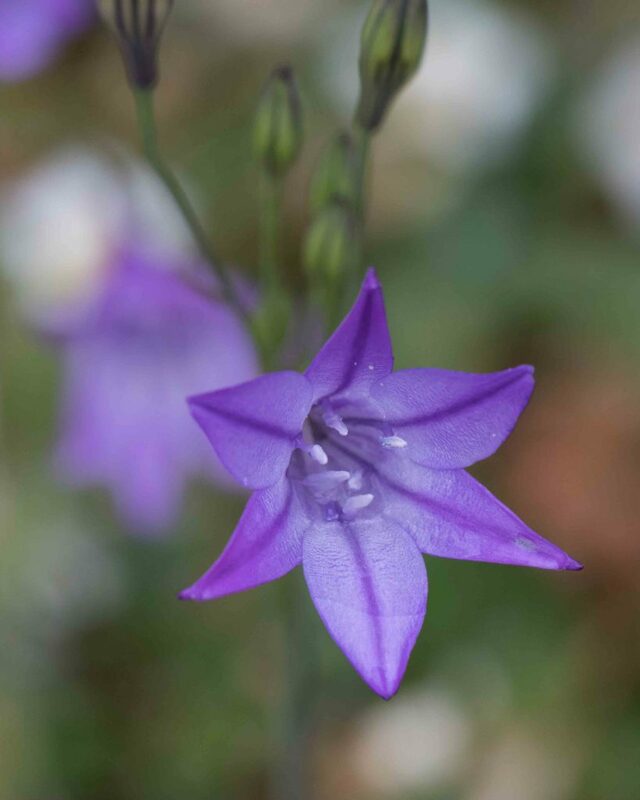 The filaments are strongly exserted and parallel to each other. 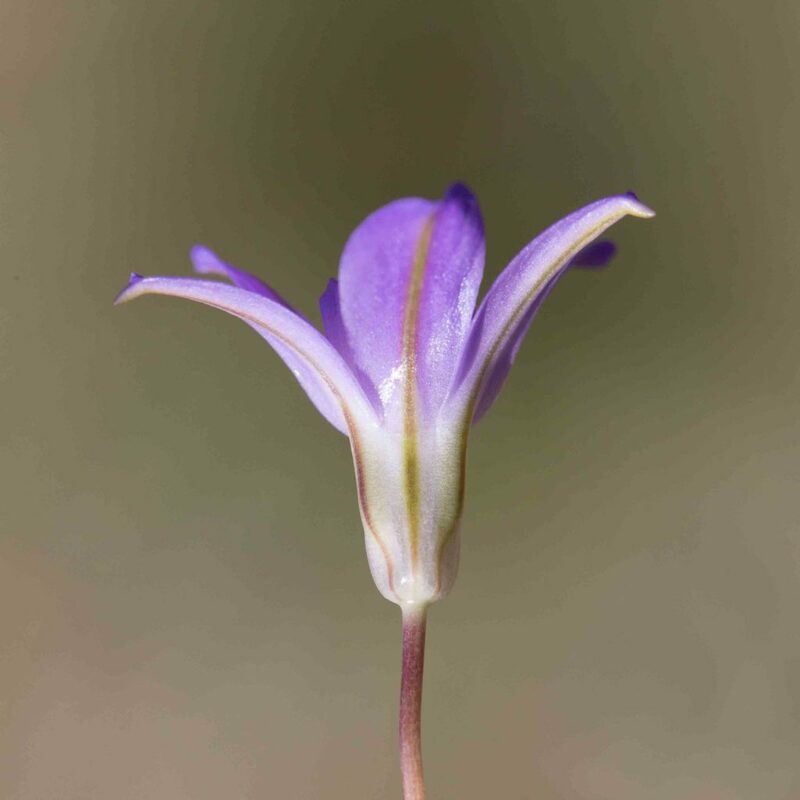 In this variety, the nectar cup cusps are awn-like, 1–3 mm long. 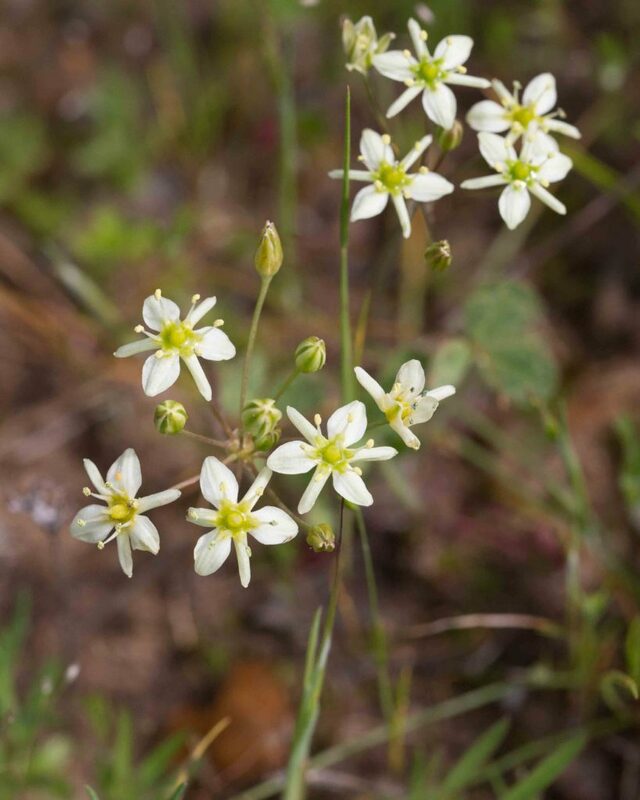 An uncommon plant, generally found in the southeastern part of the county. 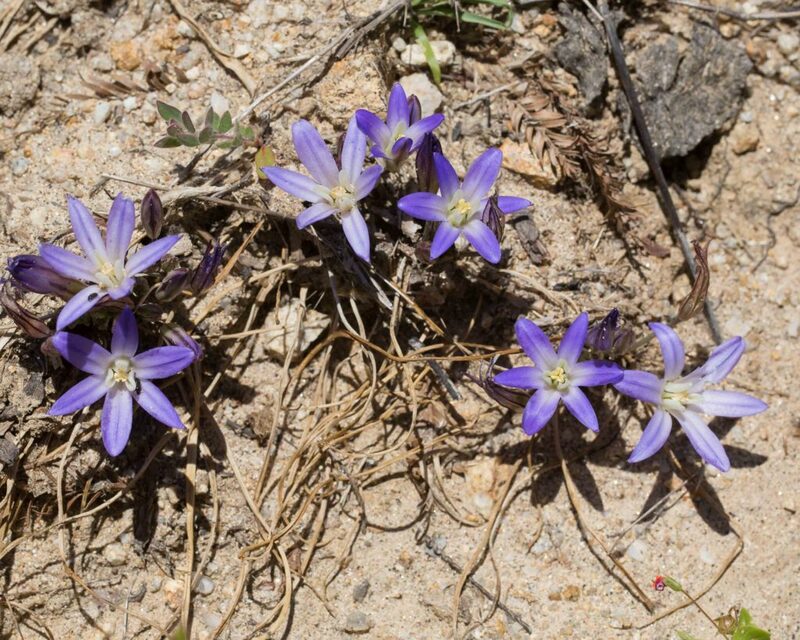 This is essentially identical to var. 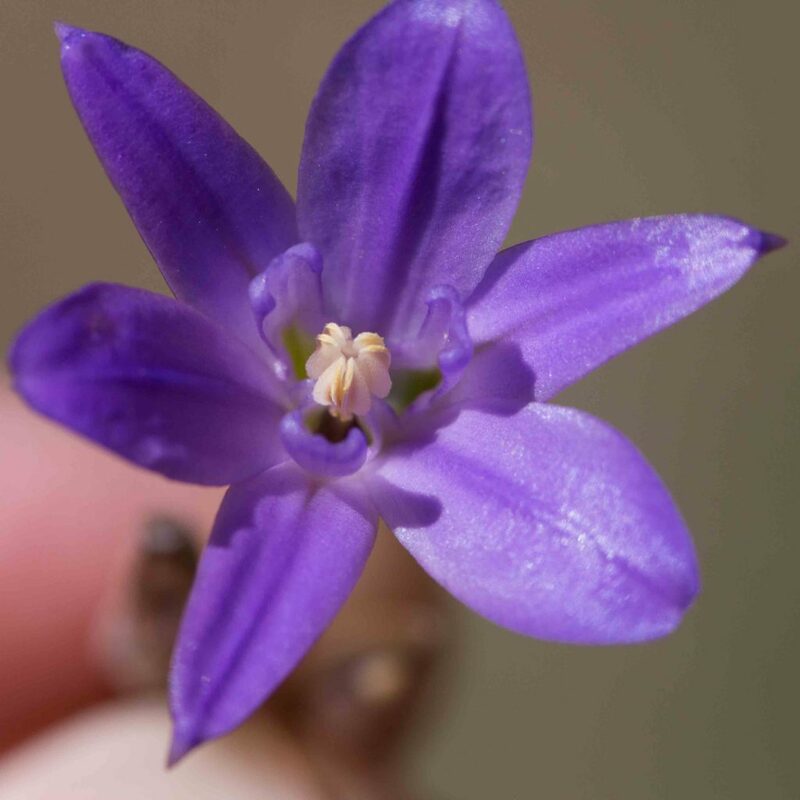 aurea except that the the nectar cup cusps are very shallow and not awn-like, < 1 mm long. 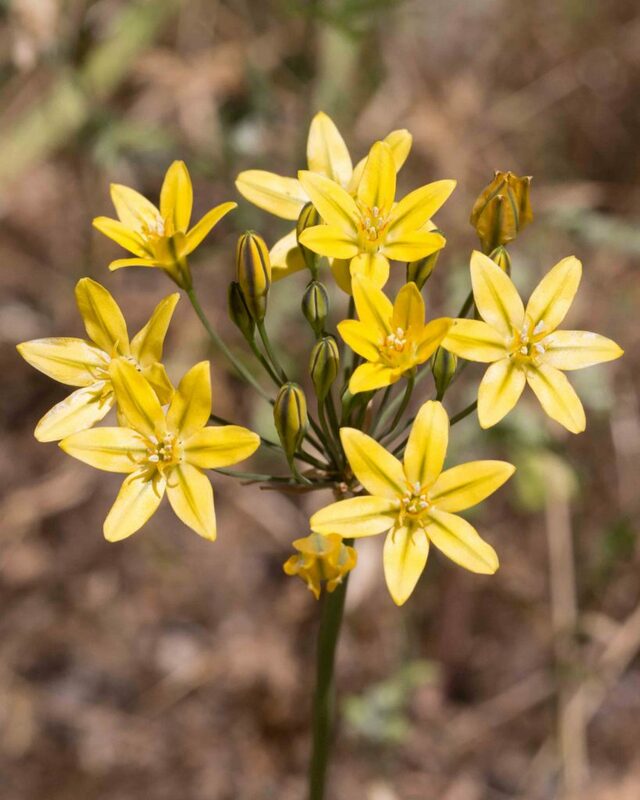 An uncommon plant, generally found in the southeastern part of the county but also found on the Cachagua Road. 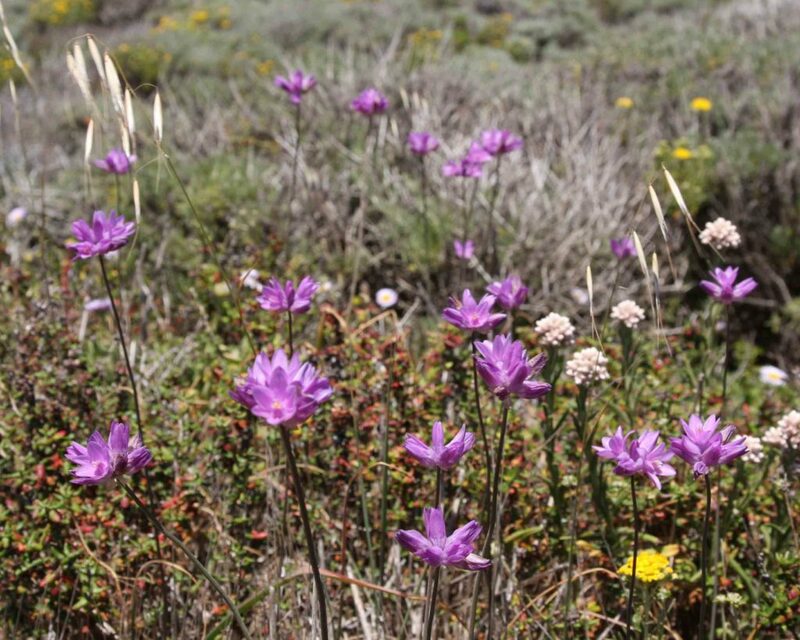 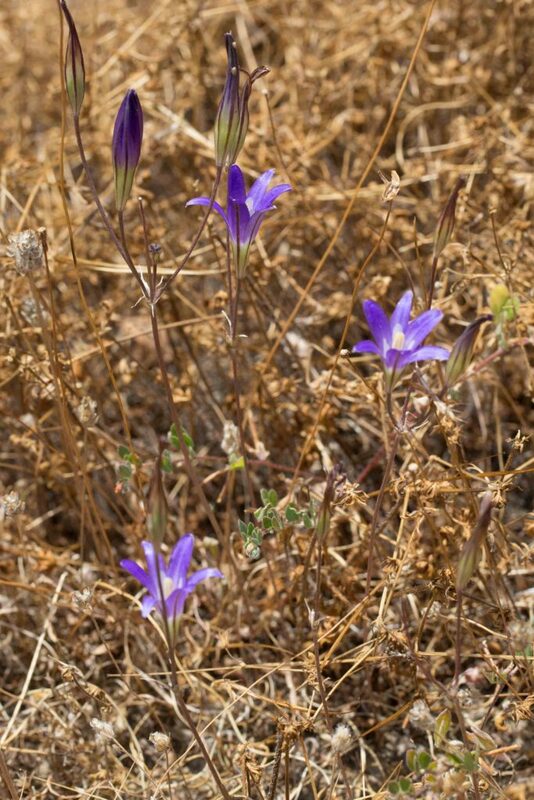 This is similar to Mesa /Jolon Brodiaea. 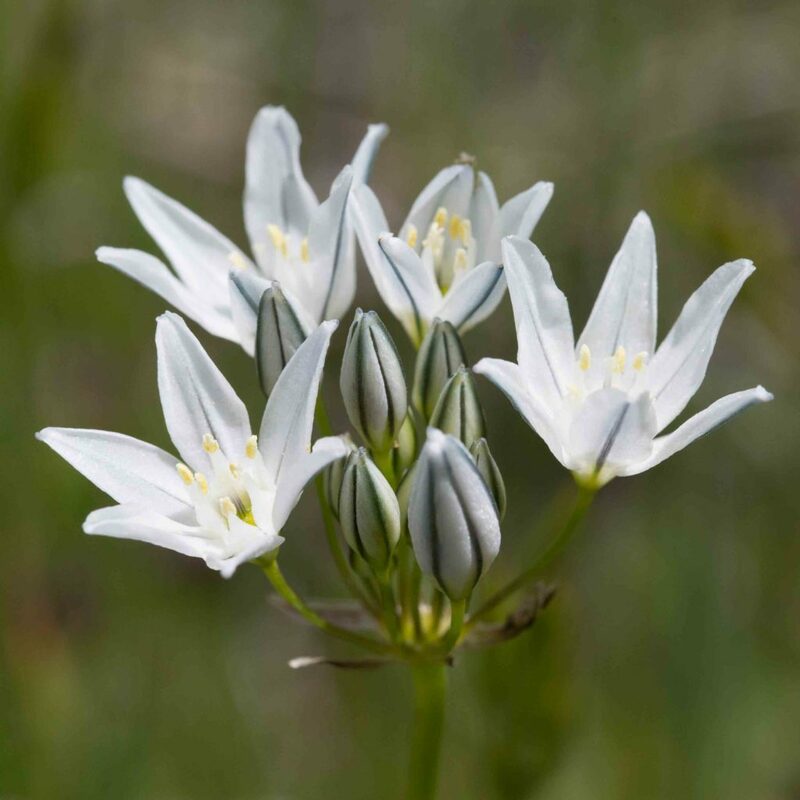 It is sometimes a little taller and distinguishable by its staminodes, the more or less erect sterile stamens that are white and barely inrolled on the margins and parallel to or leaning slightly away from the true stamens. 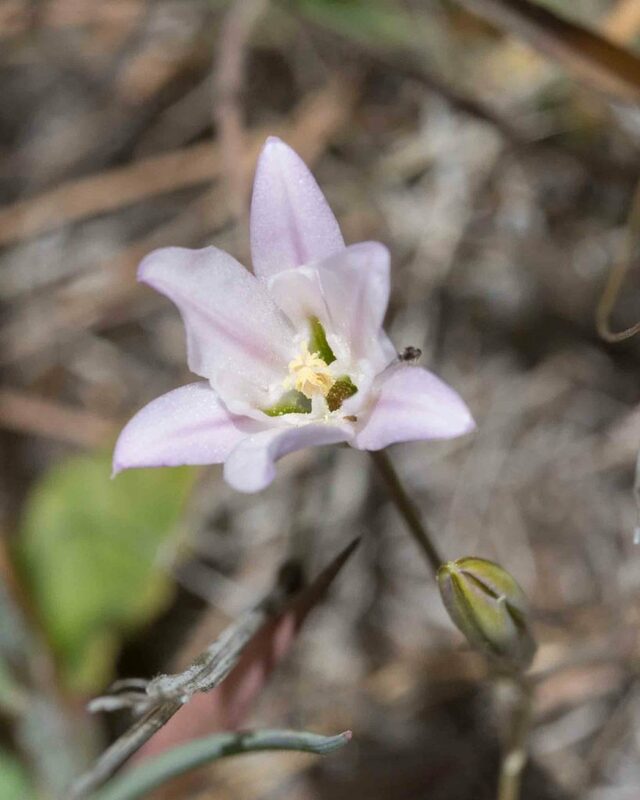 The whitish anthers are not notched, unlike both Mesa /Jolon and Dwarf Brodiaeas (Brodiaea jolonensis & terrestris). 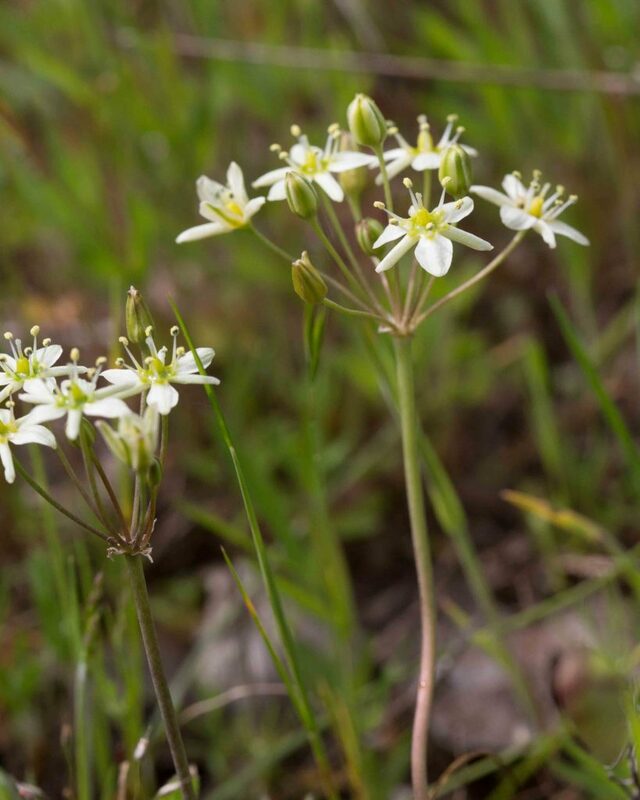 As the alternate common name suggests, this is common in the Fort Hunter Liggett / Indians area although also found in counties further south. 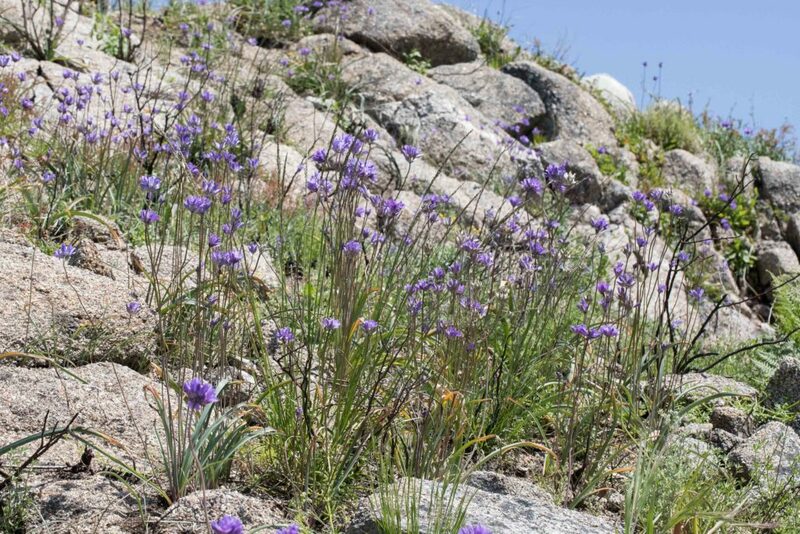 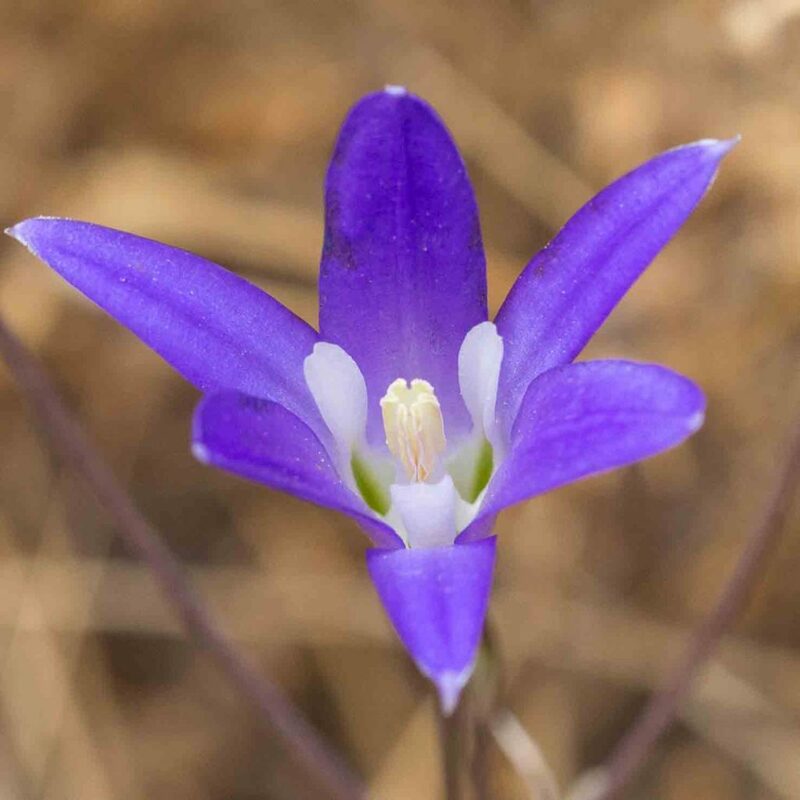 It is similar in color to but taller than Dwarf Brodiaea (Brodiaea terrestris) and can be distinguished by its staminodes which are violet with square tops, slightly incurved on the sides and leaning inwards towards the stamens. 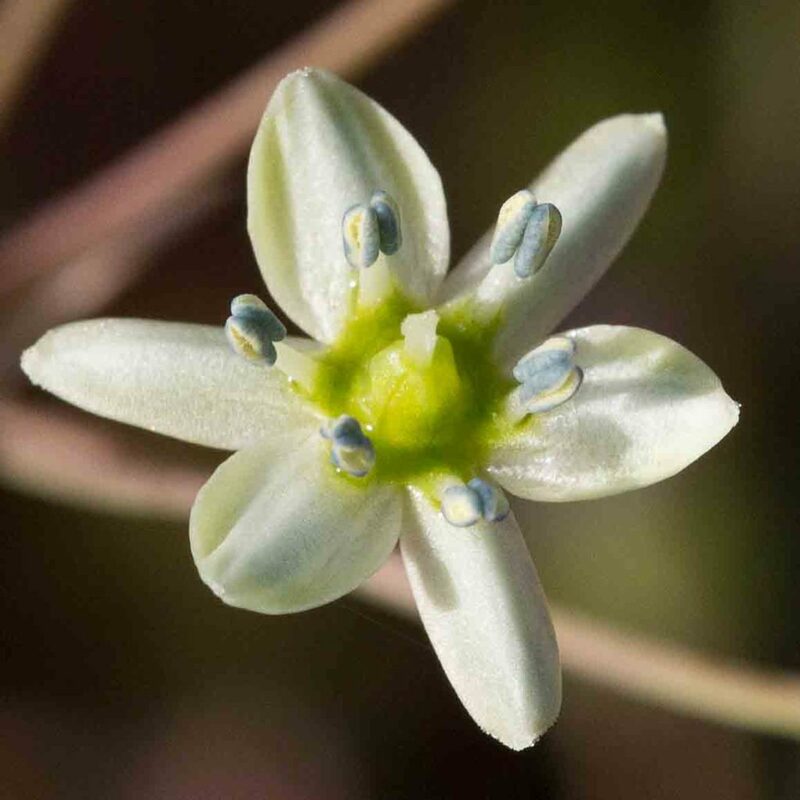 The anthers are whitish with a V-shaped notch. 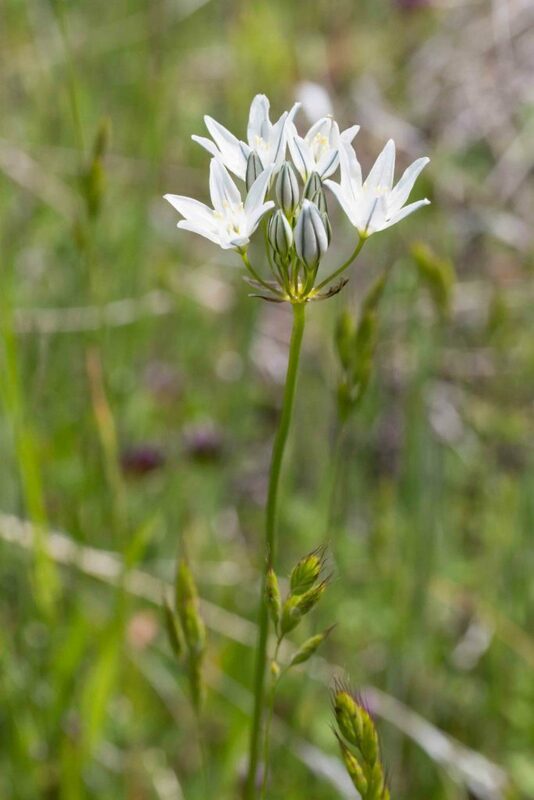 Pale, almost white forms are occasionally found. 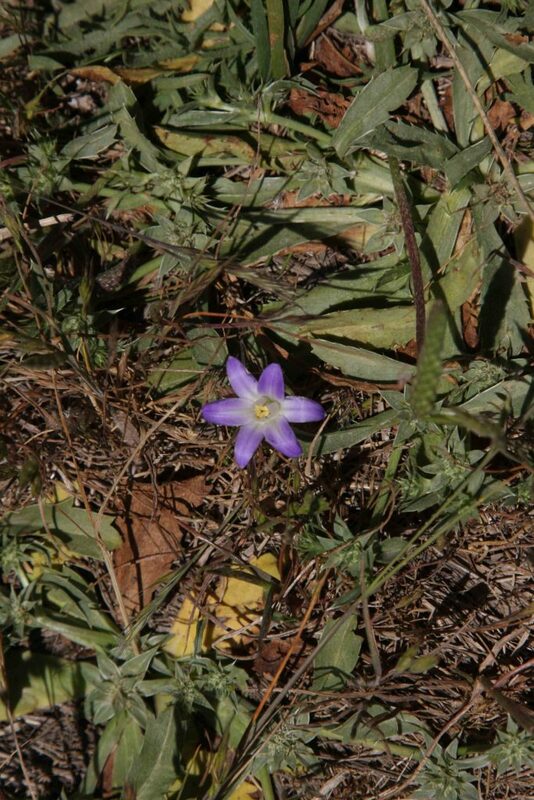 As the common name suggests, this is a very low-growing plant. 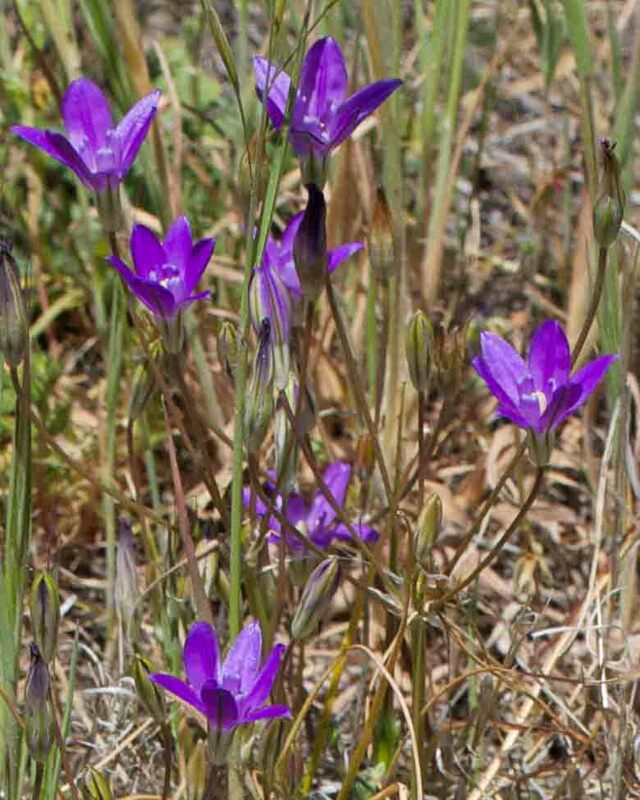 Its violet, bell-shaped flowers are similar to those of Mesa / Jolon and Garland Brodiaeas (Brodiaea jolonensis & coronaria) but it can be distinguished not only by its growth habit but also by its whitish anthers which have a U-shaped notch and by its staminodes which are white, noticeably incurved on the sides and slightly reflexed at the tip. 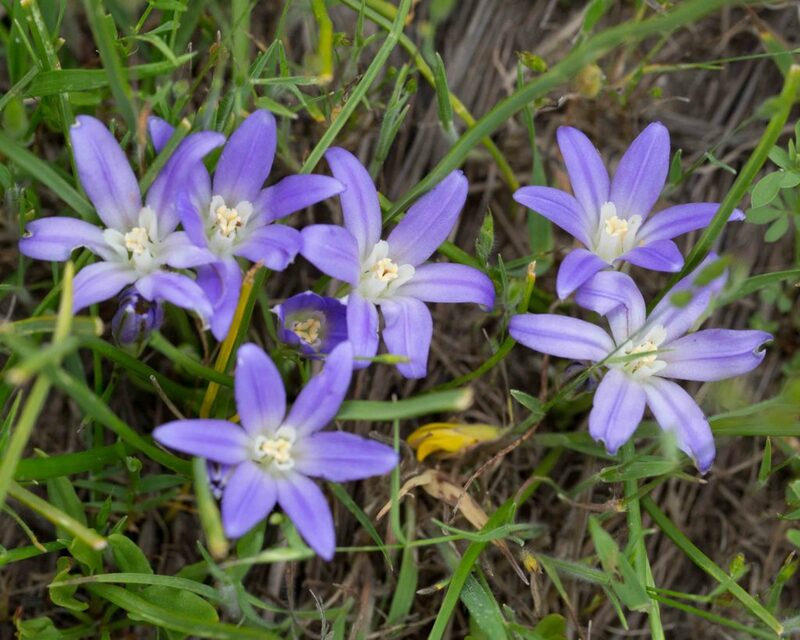 This is a common plant, easily recognized by its dense heads of 6–15 blue to pink-purple flowers. 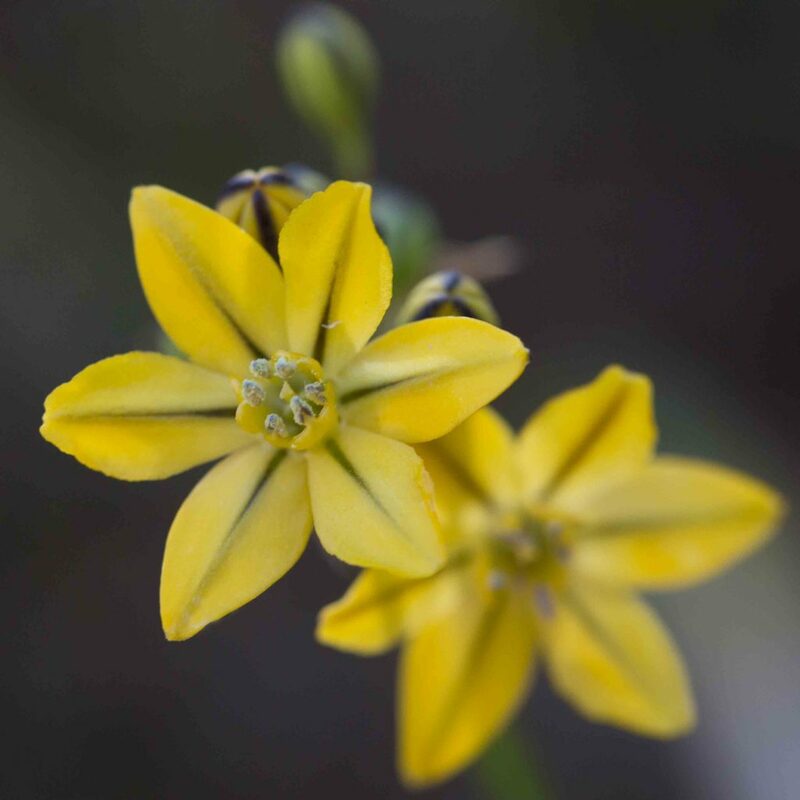 Each flower is 6-lobed with a distinctive triangular crown in the center which leans in towards the anthers but is reflexed and deeply notched at the tip. 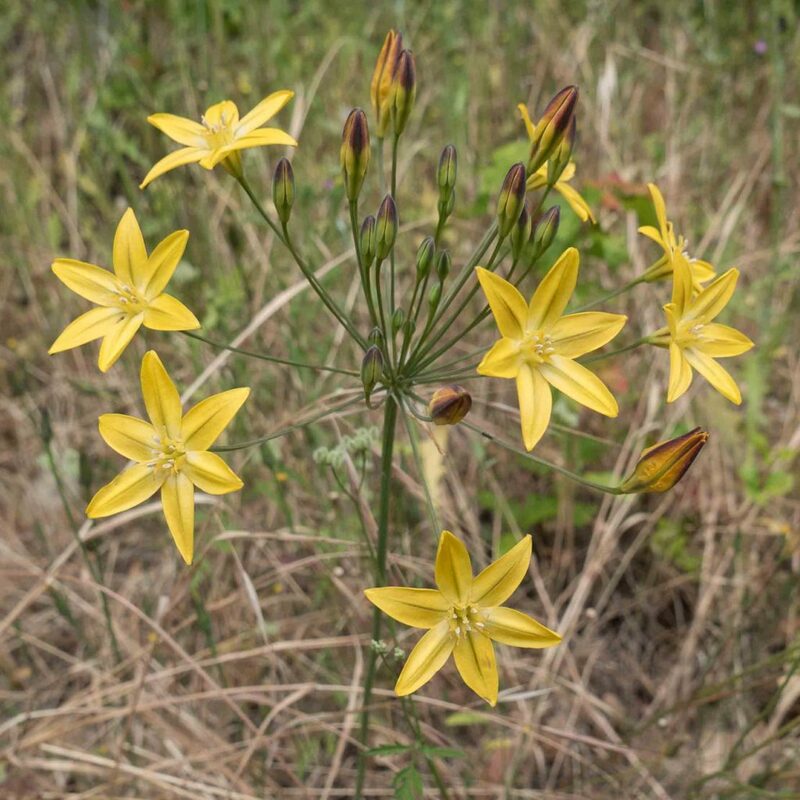 There are 2–3 slender leaves as long as or longer than the stems. 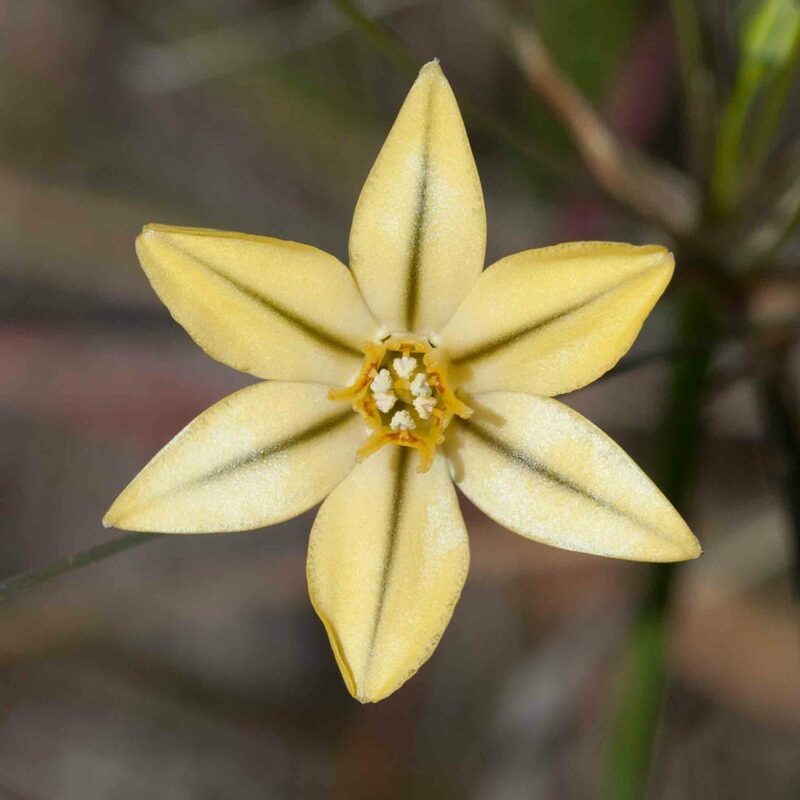 This has an erect stem with 3–10 linear, basal leaves, 10–70 cm long. 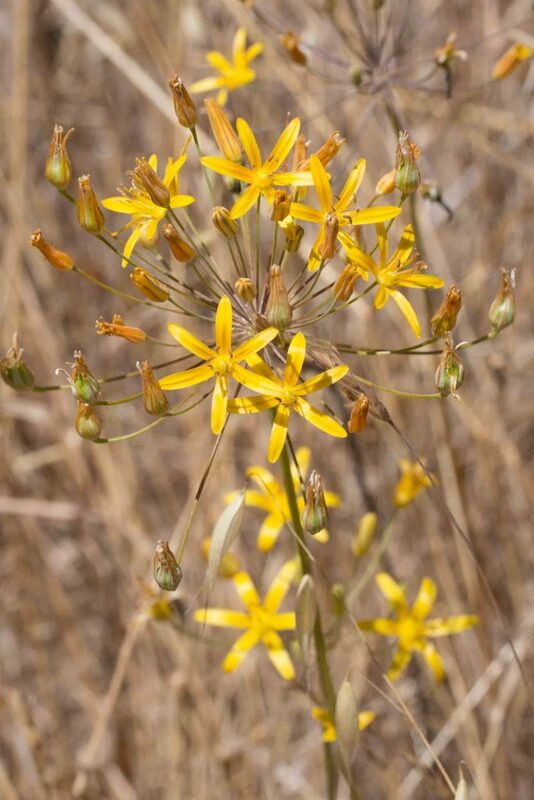 The flowers are in umbels of 6–15 on pedicels < 5 cm long. 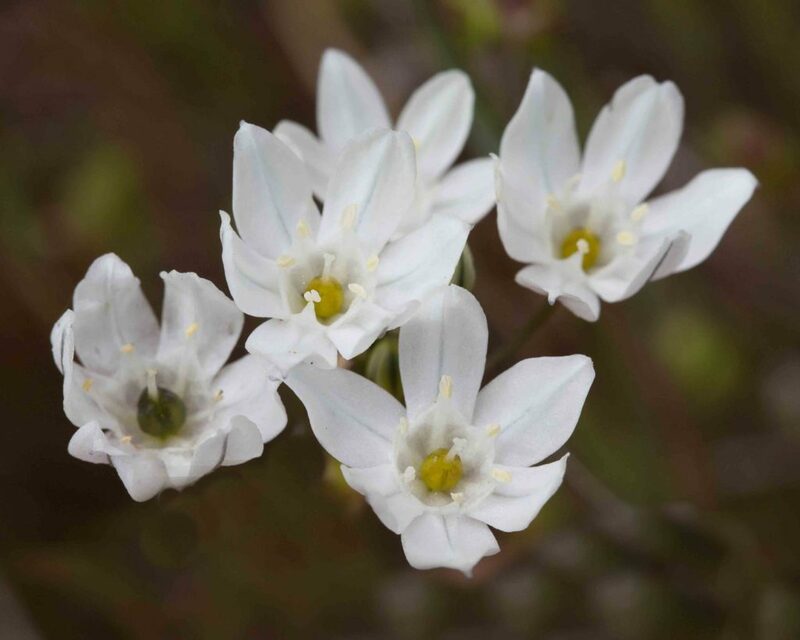 Each flower has 6 perianth lobes, < 6 mm long, greenish-white in color with brownish midribs. 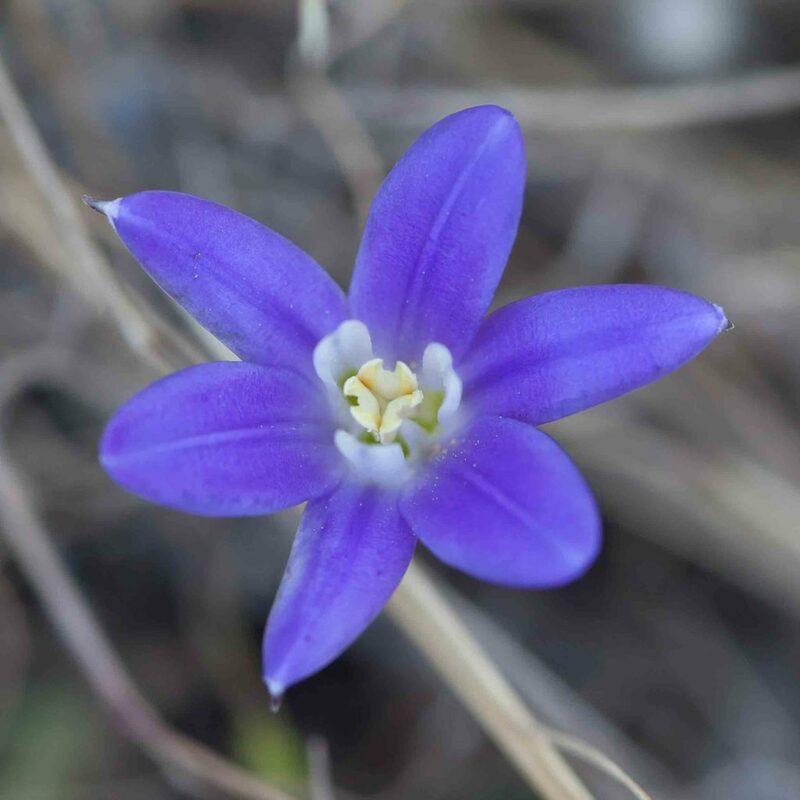 There are 6 erect stamens with blue, green or purplish anthers. 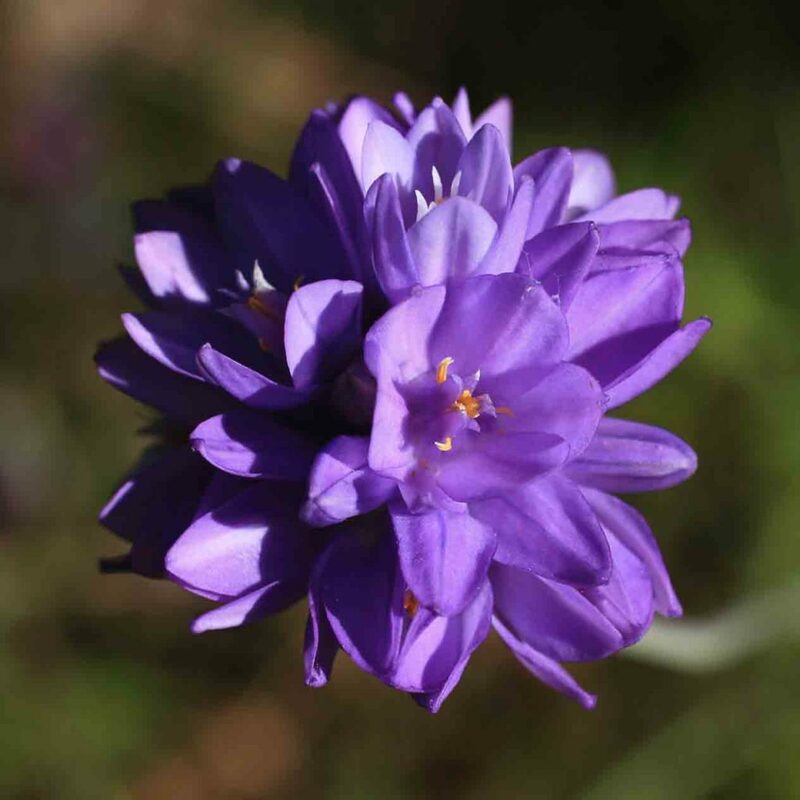 “Muilla” is “Allium” (the scientific name for the onion genus which this plant resembles) spelled backwards. 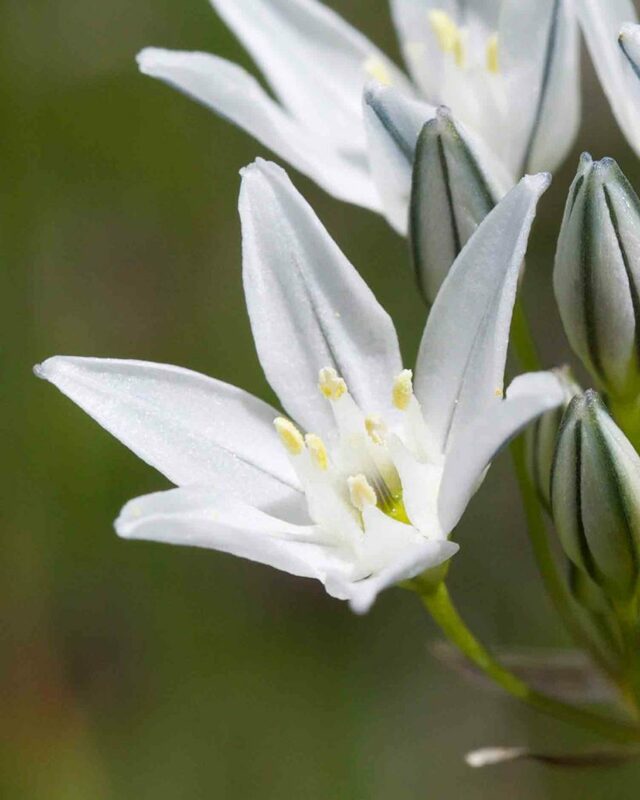 This is like other Brodiaeas in its general appearance but with flowers that are pure white in color with green midveins. 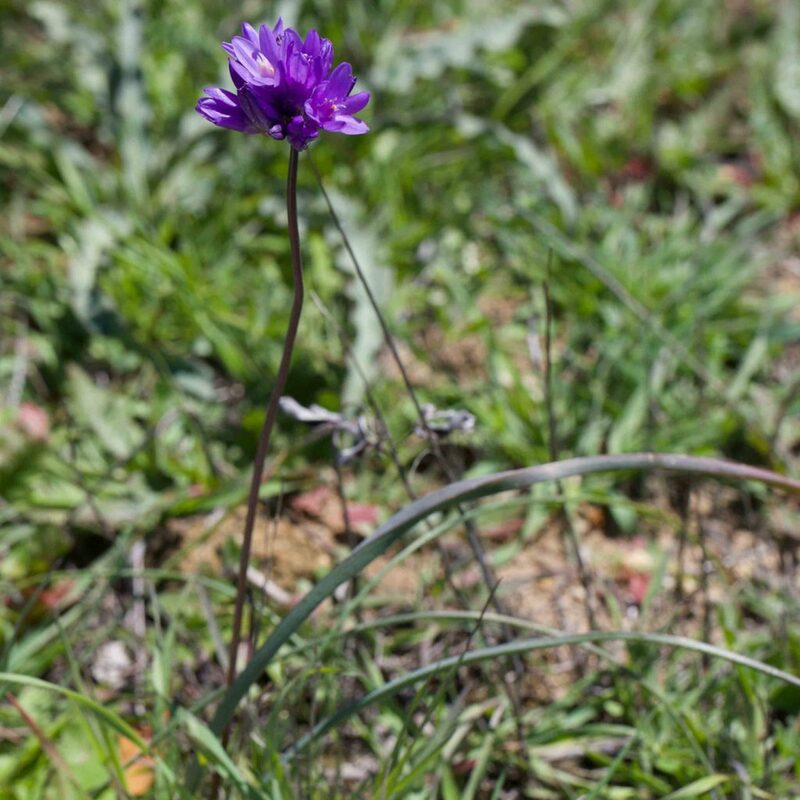 The perianth lobes are not narrowed at the base. 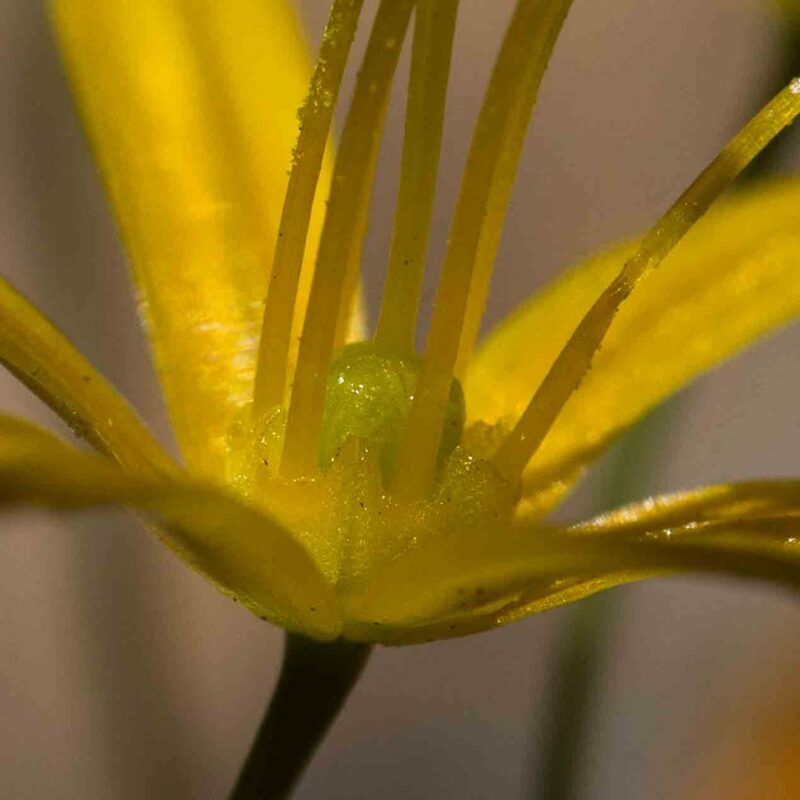 The stamens are of equal length and attached at the same level (something that it not true of all members of this family). 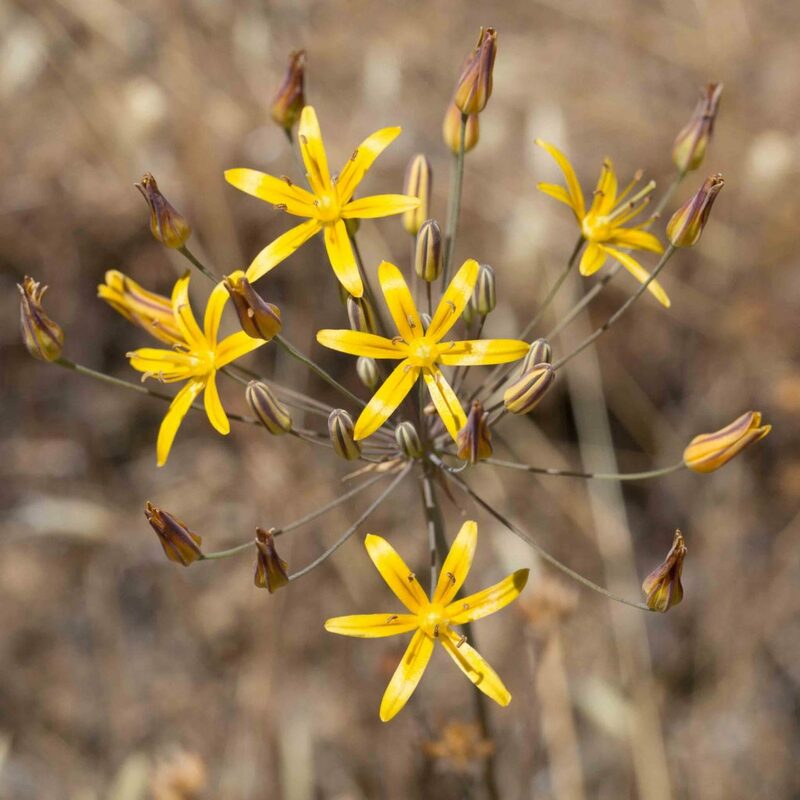 Leaves are 10–40 cm long and up to 22 mm wide. 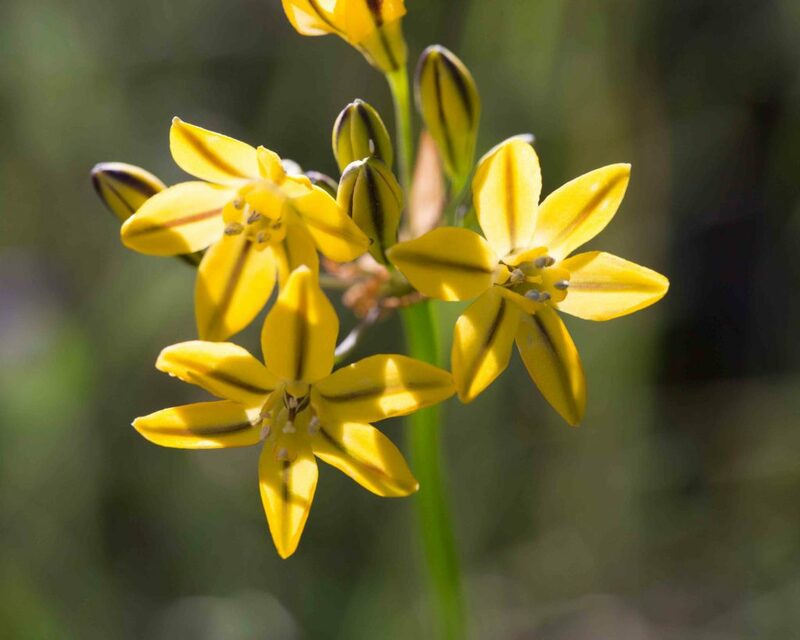 This beautiful flower is common late spring to mid-summer. 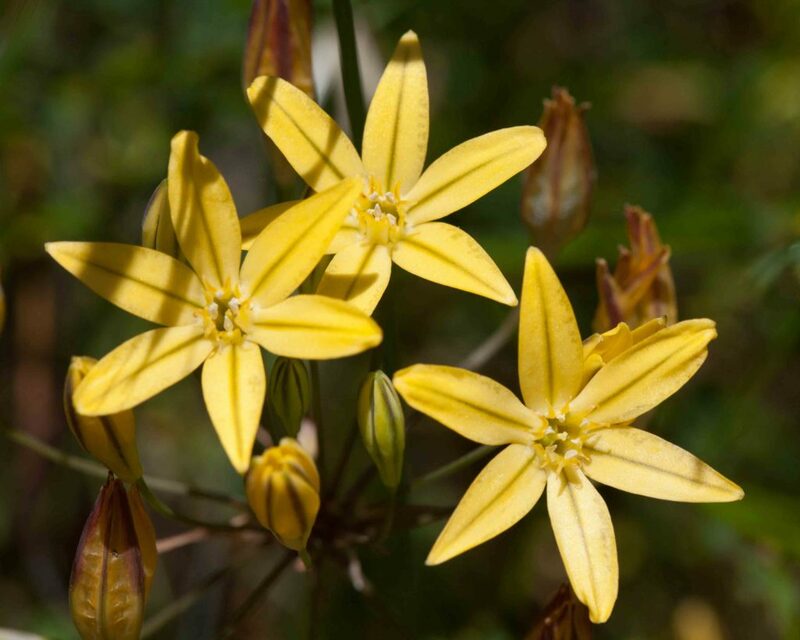 It has a single stem with an umbel of golden star-shaped flowers, each limb with a dark central vein. 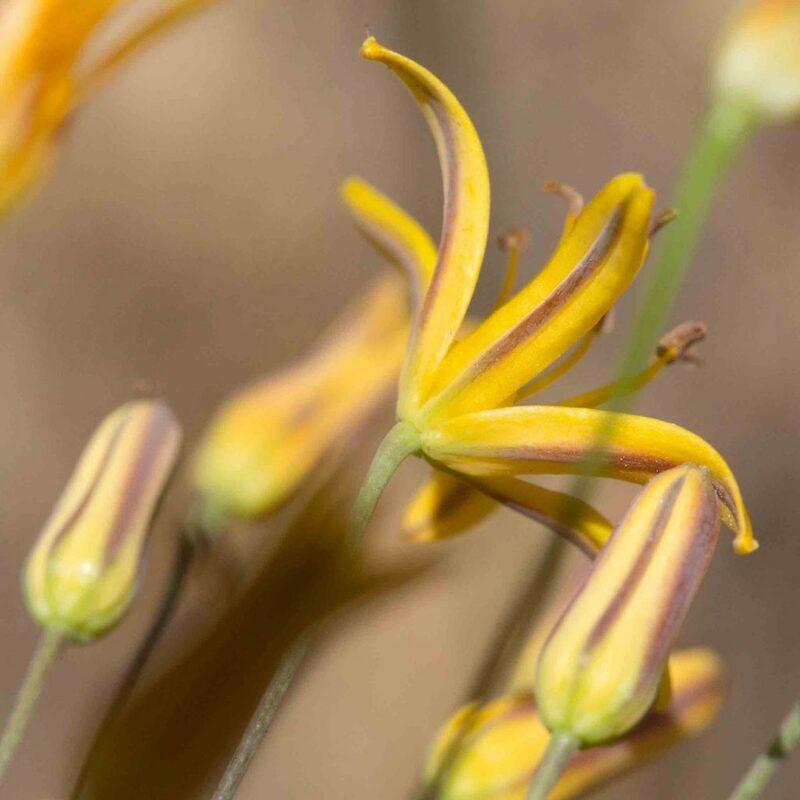 The 6 flat stamens alternate between long and short, the long ones with horn-like appendages. 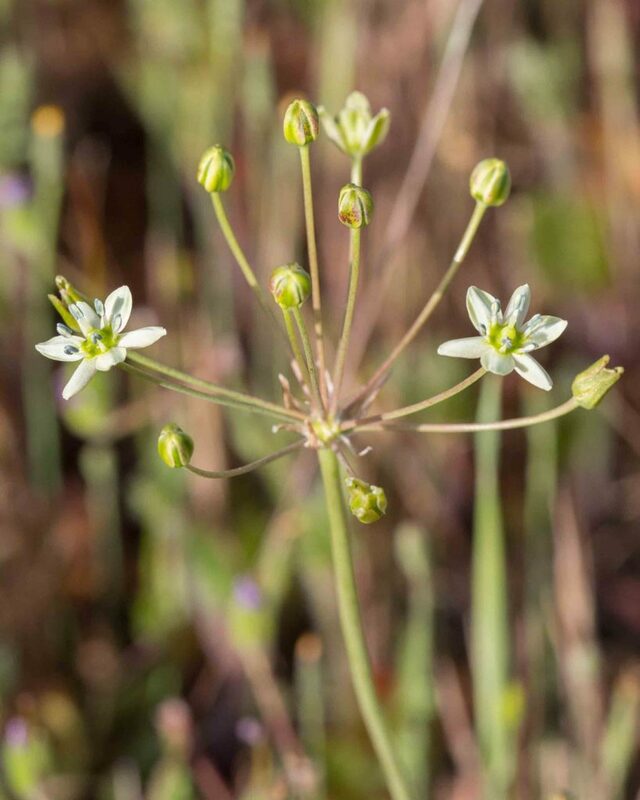 Much more common north of Monterey county than within it, this has a tall stem with an umbel of blue-purple or white flowers. 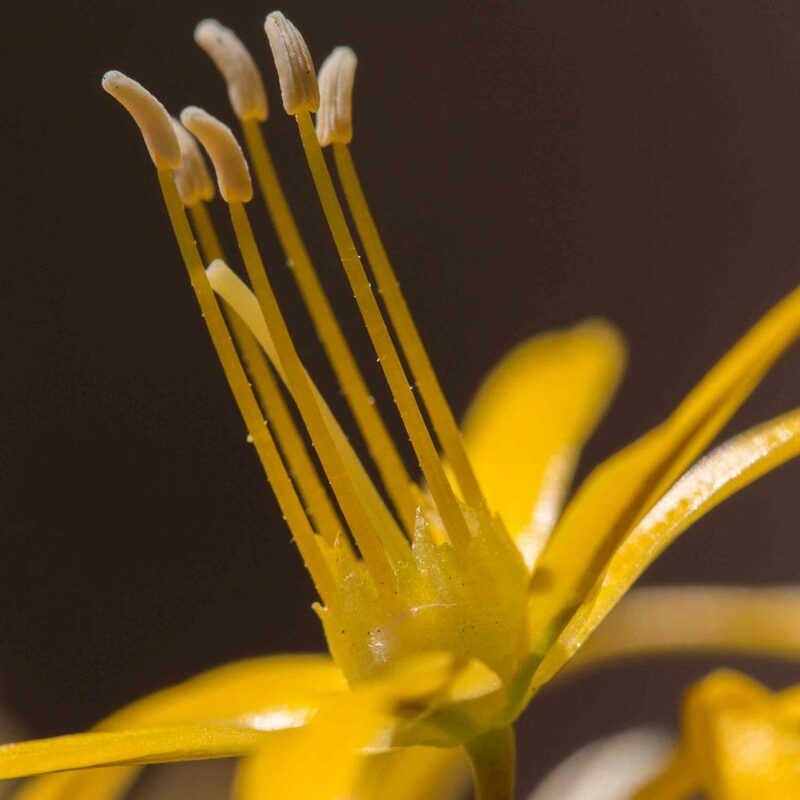 The flower tube is tapered at the base and the stamens are of equal length. 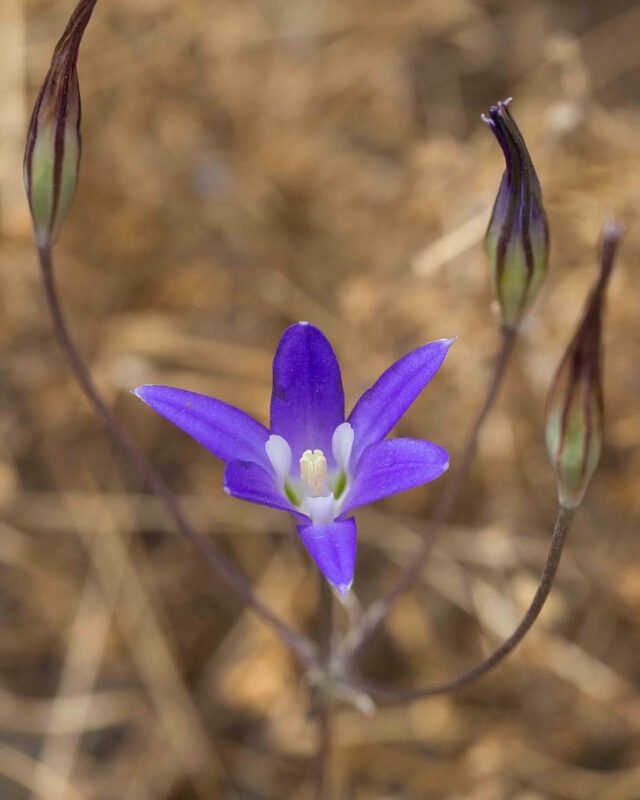 This is the only bluish-purple Triteleia to be found in the county. 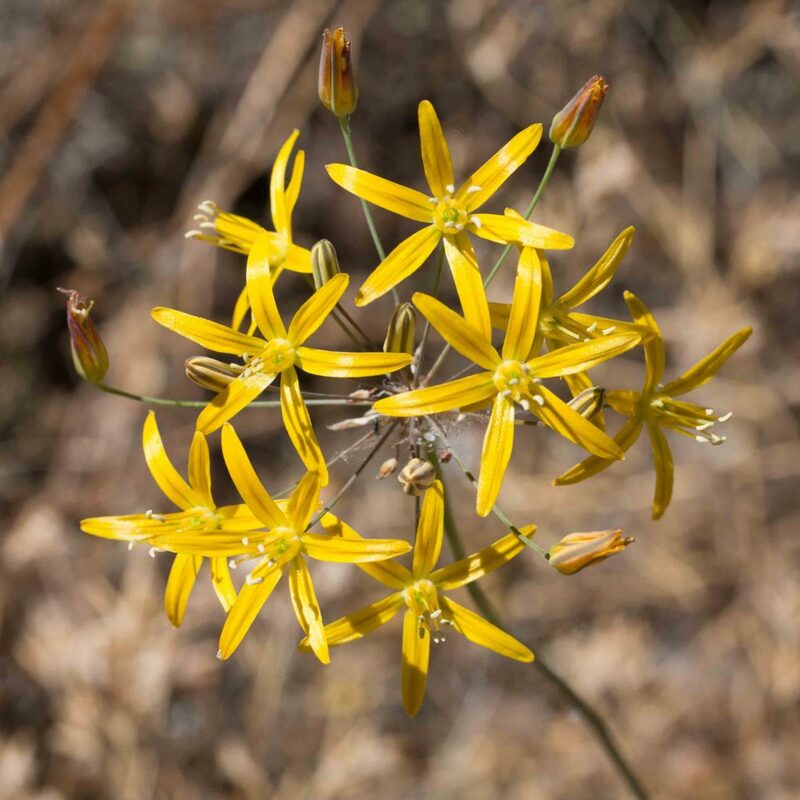 This is an uncommon flower, found only near the Monterey / San Benito County line. 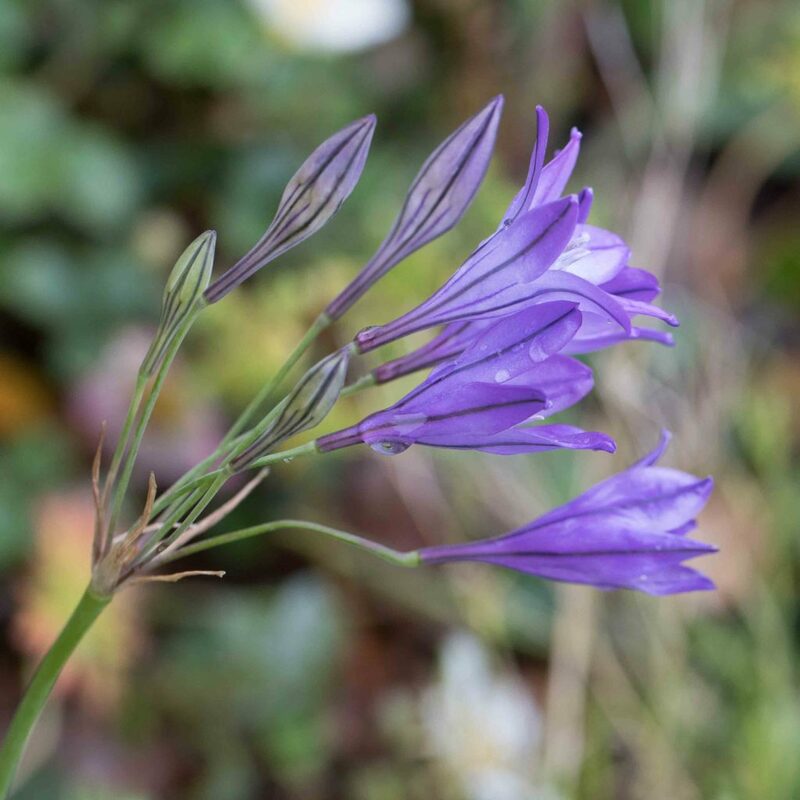 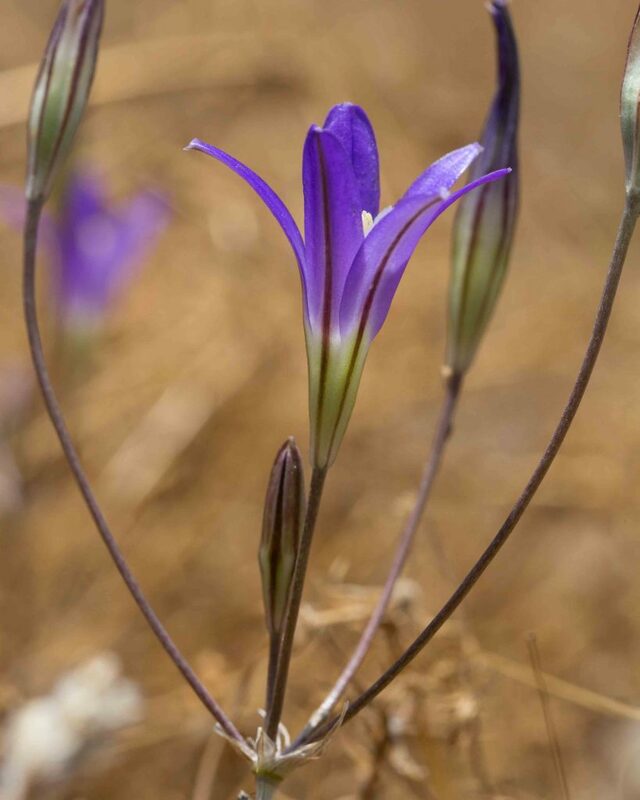 Easily mistaken from Golden Brodiaea (Triteleia ixioides) but distinguished by the tips of the longer stamens are rounded and knobby and lack the horn-like appendages found in Golden Brodiaea. 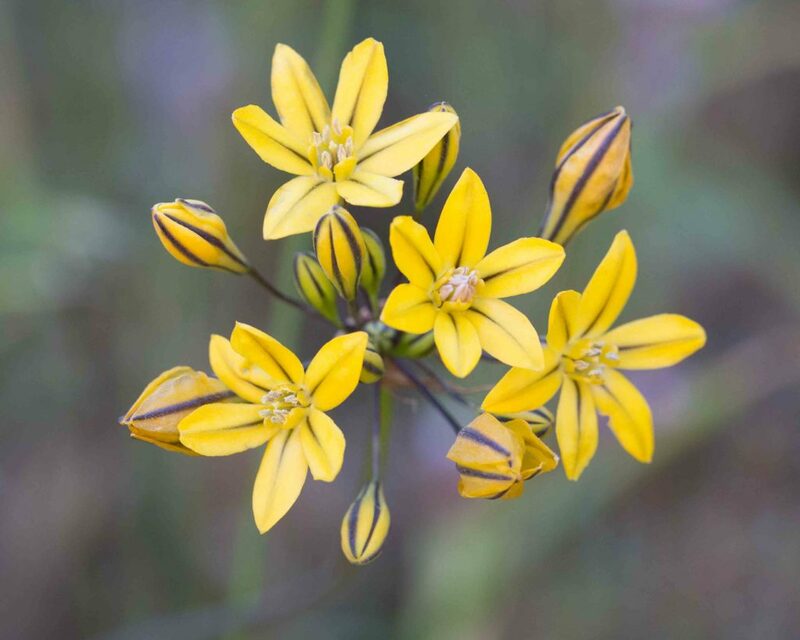 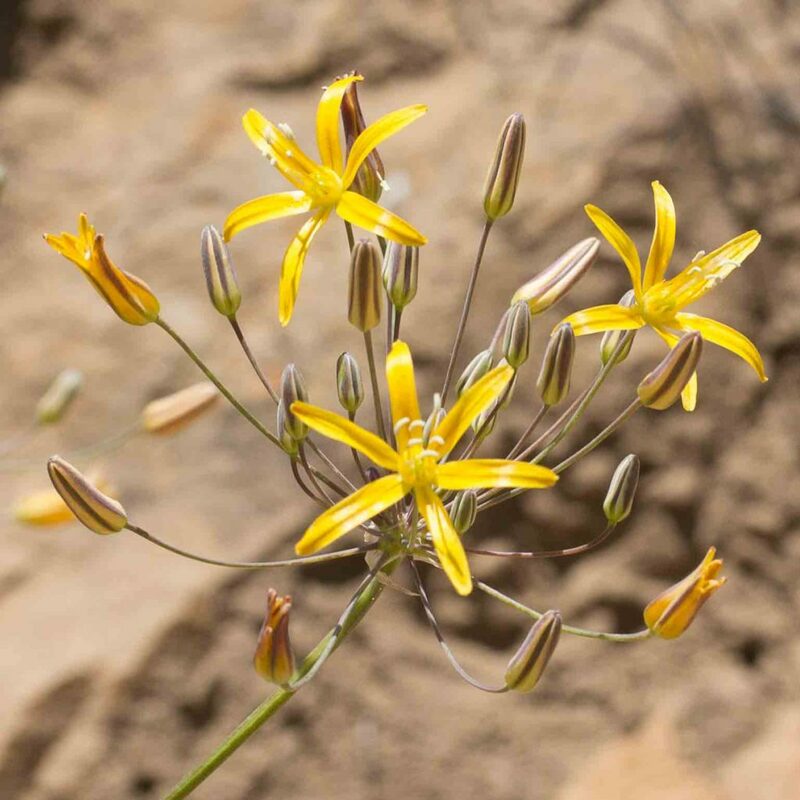 The flowers are slightly smaller than Golden Brodiaea, deeper yellow in color and with prominent dark veins on each limb. 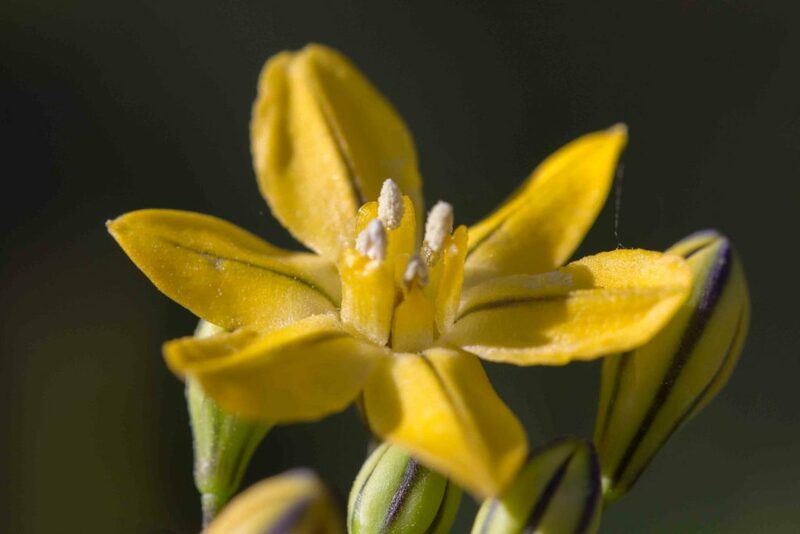 The pedicels are also shorter (10–25 mm vs 10–70 mm) so the inflorescence has a more compact appearance.